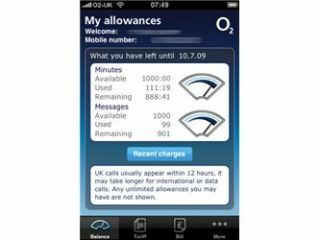 O2 has launched its very own app on the iPhone - imaginatively titled My O2 - which allows users to see how much they're spending. Using the same system as previously offered online or by text, users can see how much they're spending via speedometer-style graphics or just the plain old list of minutes and texts used. The move is another example of O2 branching out to offer customers more than just phones, as shown by the recent release of O2's Money pre-paid card. "Our customers want to stay in control of how much they spend whenever they like. The My O2 iPhone app allows them to do this with the minimum of fuss," said Sally Cowdry, Marketing Director for O2. "We wanted to make this information as easy to view as possible. This is all part of our commitment to a great customer experience and we'll be looking at rolling this out to other phones in the near future." The My O2 application is available as a free download from the iPhone App Store, and O2 promises secure logins so others can't hack you account and find out how much you're using the phone.